I love this time of year when the wild roses start blooming. I have tried a few recipes using these wonderfully fragrant rose petals. This year I decided to try making and canning rose simple syrup. Note: You don’t have to can this recipe, you can make just a pint or two and put them in the refrigerator. If you want to make a larger quantity, then you might want to try canning it. It’s really easy! We live in an area close to the mountains where there are lots of wild roses. When you pick roses to use to prepare for a recipe like this, you want to make sure that you pick roses that haven’t been sprayed with any pesticides. The recipe for simple syrup is very easy. It is a 1:1 ratio of sugar and water. You can use this recipe to make any kind of simple syrup. I have also used this recipe to make ginger simple syrup and lilac simple syrup. The 1:1 ratio means that for every cup of sugar you use, you need one cup water. This is the recipe that I used. This recipe will make about 9 pints of rose simple syrup. A lot of recipes call for using the same amount of rose petals as water and sugar, but I never have enough rose petals. You don’t have to have a certain amount of rose petals, but the more you have the more fragrant your rose simple syrup will be. Rinse the rose petals in a colander like this one to remove any dirt or insects that might have made it home with you. You’ll be surprised at what you find hiding in your rose petals. Place the sugar, water, and rose petals in a large stock pot and bring to a simmer, stirring occasionally. Take the pan off the heat and let sit for several hours so that the water takes on the flavor of the rose petals. Pour the cooled liquid through a fine sieve to remove the rose petals from the liquid. Place the liquid back in the large stock pot. Stir in the lemon juice. Adding the lemon juice is optional. The lemon juice is not necessary for canning this recipe. The acid level is high enough with the amount of sugar in the recipe. The lemon juice, however, will change the color of the syrup from the dull color it is now to the vibrant color of the original rose petals. It’s like magic, watching the syrup change color! If you are going to refrigerate your rose syrup you can just pour into containers or mason jars and place in the refrigerator at this point. If you want to can the syrup, then place your canning jars, rings, and lids in the dishwasher to sterilize them. Bring the rose syrup back to a simmer. When your canning jars are sterilized, pour the hot liquid into the canning jars, leaving 1/2 inch head space. You can easily measure the head space with this inexpensive canning funnel. Wipe the rims of the jars with a damp paper towel or dish cloth and place the sterilized lids and rings on the jars. Place the jars in a boiling water canner and cover the jars with water, making sure there’s at least 1 inch of water over the tops of the jars. Bring the water to a boil and boil for 10 minutes. Remove the jars from the canner and let them sit on a towel on the kitchen counter to cool. After the jars have cooled, checked the lids to see if they are sealed. If you press down the lid and it is flat and doesn’t pop back up, then it is sealed. If any of your jars didn’t seal you can place them in the refrigerator to use up in the next couple months. Sealed jars can be stored in the pantry for several years. 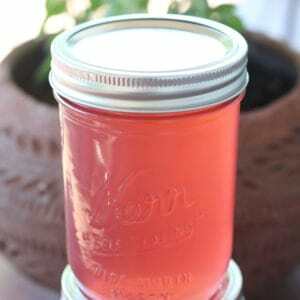 This rose petal simple syrup is very easy to make. You might be wondering what you can use it for? Rose simple syrup can be used to flavor iced teas, lemonade, kombucha, and cocktails. Rose petals can be used to prepare other recipes too! I’ve used rose petals to make simple rose petal jam, rose petal jelly, rose petal iced tea, and rose petal infused honey. Yum! If you like this recipe, in the fall you can use rose hips from the same rose bushes to make rose hip syrup. 4 Comments on "Rose Syrup"
Can I use dried roses? Hi! I don’t think it would hurt anything to use them, but I’m not sure that you would get the same flavor from them. It would be worth trying. Can you use roses not wild if they have not been sprayed with insect repellent? Can splenda be used instead of sugar?